On Wednesday I finally arrived in Marseille, where I will spend a few days to enjoy this beautiful city. I’ve been working so much lately, that – now I’m here – I’m “lost in translation” in more than one way. I’ve been working on translating this blog for you guys but have to finish it up later, since I just haven’t had enough time, besides all my other projects. But of course now you will get fresh new blog posts, which might be even better. I’m in France! Thinking back at my school time, where I had no choice but to take the Latin class instead of French. Now I could tell you, how useful that is in life, if you don’t want to become a doctor or lawyer… It’s NOT! Fortunately everyone here is super nice and a lot of people are speaking english, so finding your way or getting answers to any questions should not be a problem. You want to come with me onto this journey? on either of those networks. 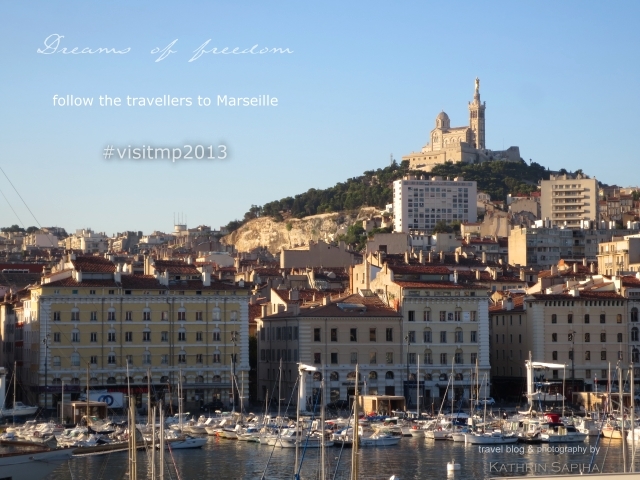 Marseille is the European Capital of Culture in 2013 and definitely deserves that title. We already have visited so many beautiful and interesting places in the area. You will find the detailed story here on Dreams of Freedom in a little while and many many photos as well. Have you been to Marseille before? If you already have visited Marseille and want to share your experience, leave me a comment below.